The September PADI IE has been completed. Both Nienke and Jeff did well. Nienke had almost straight 5's for all of her presentations and Jeff did also very well, except on the Open Water presentation where he had a problem with tying a sheet bend. 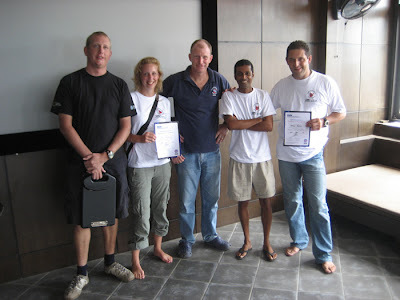 On the picture from left to right; Thomas Knedlik, the PADI Examiner; Nienke Rakhorst from the Netherlands; Camille; Amit Padgaonkarn, IDCS and Jeff George from the UK. 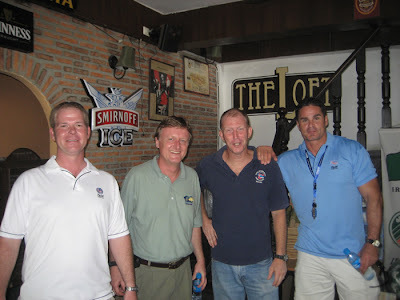 During the IE, there was a PADI delegation visiting Koh Tao, with some high ranking guys. On the picture from left to right is Mark Spiers, head of sales for PADI AP; Henrik Nimb, vice president of PADI AP; myself and last but not least, Hans Ullrich, the Dutch regional manager for Thailand. It was 12 years ago when Henrik visited Koh Tao the last time, when he was an Examiner himself. He had a good time on Koh Tao and he enjoyed being back again and see the immense development that Koh Tao went through during the last 12 years with his own eyes.